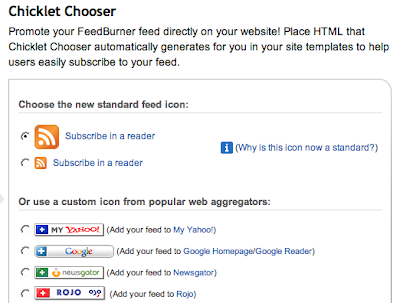 A few bloggers on the BlogCoach Community Board requested a Feedburner tutorial. Feedburner ...burns your feeds. It does a lot more, too-- from tracking visitors to publicizing to monetizing. Here's a little rundown of how I use Feedburner. Feel free to add your own Feedburner tips and questions to the comments as well. When prompted, sign up for FeedBurner PRO service. 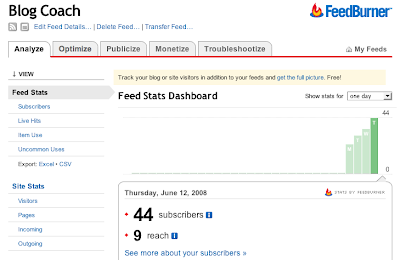 It's free and allows you to see stats on "Reach" and "Item Views." The Chicklet Chooser under the Publicize tag allows you to post sharing options on your sidebar. Though it's great to offer your readers this service, you don't have to use FeedBurner for this. 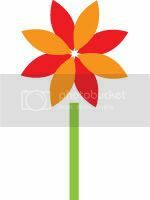 I recently switched to addthis.com for my sharing buttons. 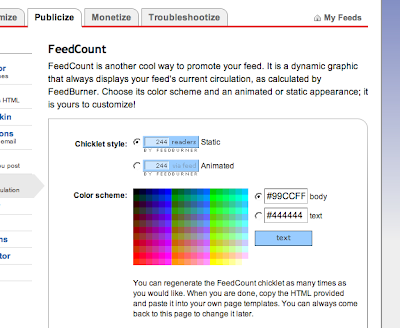 FeedCount, also under Publicize lets you post a button on your blog that tells people how many feed subscribers you have. I recommend skipping this button unless you have a number worth bragging about. You don't want to advertise how many subscribers you don't have! If you have a lot of subscribers, you may want to sign up to display ads in your feed. You can do this under the Monetize tab. After you sign up, you wait until an advertiser chooses to place an ad in your feed. Feedburner sends you an email so you can approve or reject the ad, and then it's placed in your feed for a specified period of time. You choose whether you want the ad displayed on every post, every second post, etc. 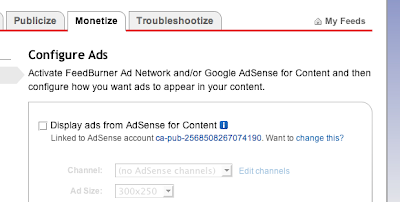 You can also choose to display AdSense ads at the bottom of your posts on your blog itself. I chose to have Feedburner ads on my feed, but not on my blog. To monitor your earnings, just check your Feed Account Ad Stats page under My Account. You'll be paid monthly. To see at a glance how many subscribers you have, bookmark the My Feeds page or the Subscribers page. I actually prefer the Site Visitors page as a landing page. I like to see my unique visits for the day and where my readers are clicking to me from geographically. A few of you have said that your visitor info isn't showing up. If you're showing zero visitors, and you know you have more than that, you may need to activate FeedFlare for your site and make sure you've upgraded (for free) to Pro. FYI - I've been comparing Sitemeter, StatCounter and Feedburner unique visit stats and I'd have to say that of the three Feedburner's visitor stats seem the least reliable. They're occasionally lower than I know they should be. In addition to checking out the site visitor graph, I also like to check the Incoming and Outgoing links pages. The free version of Feedburner doesn't let you see much, but you do get to see the top 20 sources of traffic and top ten outclicks for your site. That's pretty useful. The incoming page also lets you see what people are searching for when they come across your site in the search results. How do you make FeedBurner work for you?